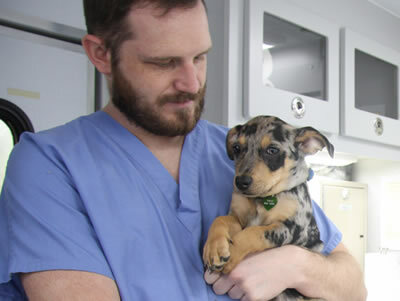 One of the missions of the Veterinary Health Center is to provide high quality clinical training for our students. The VHC also serves to provide excellent service to its clients and care to its animal patients. With this in mind, the responsibilities given to a student on a clinical rotation may be tailored by the clinician based on the clinical situation and the assessed competence and behavior of the student. Students will be given guidance and feedback to help them improve their performance during the course of a rotation. However, a student’s participation in a clinical rotation may be significantly restricted when a student does not make sufficient progress during a rotation, and especially when the student’s actions (or inactions) compromise his/her personal safety or the safety of personnel during the course of the rotation, or put an animal into an inhumane or life-threatening situation. Should a student’s participation in a clinical rotation be significantly restricted, it is likely that clinical activity will be supplemented with academic projects related to the subject of the clinical rotation. Moreover, when activity is restricted, the student should understand that it will most likely be associated with assignment of an unsatisfactory grade (as outlined by individual course guidelines).